Azerbaijani fencer Ruslan Hasanov won a silver medal at the Bahrain Youth World Cup. 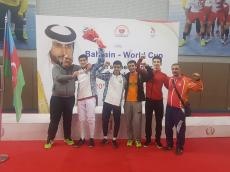 Azerbaijani male team members Ruslan Hasanov, Barat Guliyev, Kanan Malikzade and Khalid Aliyev participated in the Youth World Cup in Manama, Bahrain. Ruslan Hasanov won all five fights in the group stage and qualified to the play-off with maximum result. In the 1/16 finals, Ruslan defeated the Kuwaiti athlete Khalaf Almutairi with a score of 15:9. In the 1/8 finals, Hasanov was stronger than Saudi Arabia's Omar Alakkas -15:10. In a quarterfinal, national representative defeated Iyad Odeh from Jordan with a score of 15:13. In a semi-final, Hasanov won his Kazakh opponent Alexander Savin with a score of 15:7. In the final fight, the national swordsman lost to the Czech Republic's representative Jakub Jurka 6:15. Thus, Ruslan Hasanov won a silver medal at the Youth World Cup. After finishing the group stage with three victories, Barat Guliyev defeated rivals representing Saudi Arabia in 1/32 and 1/16 finals. But in 1/8 finals, Guliyev was defeated by Estonian Jaron Kiroj-10:15. Khalid Aliyev, who had four wins in the group stage, lost to sportsman from Bahrain Abdulla Abdul-Karam Mesfah in 1/16 finals with a score of 9:15. Kenan Malikzadeh, who finished the group stage with two victories, defeated Bahrain's Abdulla Albalushi in the 1/32 finals but lost to Brazilian Alexander Kamarga in the 1/16 finals with a score of 6:15. Azerbaijan Fencing Federation was established on April 28, 1992. AFF became a member of the International Fencing Federation in May 1992. AFF held an extraordinary report-election conference on September 20, 2017. The new composition of the organization has been identified at the meeting held at the administrative building of the National Olympic Committee. Mikayil Jabbarov, the sole candidate for the post of AFF President, was elected the head, according to the voting. Vice-Presidents of the Federation are Fikret Zeynalov and Farhad Kasimov, Secretary General is Vasif Mammadov. The members of the Executive Committee are Mikayil Jabbarov, Fikret Zeynalov, Farhad Kasimov, Vasif Mammadov, Sadig Sadigov, Yusif Huseynov and Balash Gasimov. Chingiz Mustafayev is the head coach of the national team.